The heart-stopping conclusion to the New York Times bestselling Shatter Me series, which Ransom Riggs, bestselling author of Miss Peregrine's Home for Peculiar Children, called "a thrilling, high-stakes saga of self-discovery and forbidden love." The Shatter Me series is perfect for fans who crave action-packed young adult novels with tantalizing romance like Divergent by Veronica Roth,The Hunger Games by Suzanne Collins, and Legend by Marie Lu. Tahereh Mafi has created a captivating and original story that combines the best of dystopian and paranormal, and was praised by Publishers Weekly as "a gripping read from an author who's not afraid to take risks." Now this final book brings the series to a shocking and satisfying end. I’ve always considered Shatter Me to be a work of art. Don’t get me wrong, every book is supposed to be art to some degree, but nowadays, that simply doesn’t stand true anymore. Maggie Stiefvater creates art. So does Brenna Yovanoff. Although I don’t much care for her writing, Laini Taylor is an artist as well. It is the difference between writing your story for your readers, and unleashing your authorial voice because the story threatens to burst out of you, regardless of who might read it sometime down the line. When Tahereh Mafi first thought “screw the conventions”, she crossed that line boldly. And in Shatter Me, it was clear in the way she stayed true to Juliette’s voice, her mental condition and her traumas. She never wavered, even when Juliette’s narration became downright nonsensical, she never once toned it down. As the story progressed and Juliette changed and grew, her thoughts became less scattered and her metaphors less elusive. 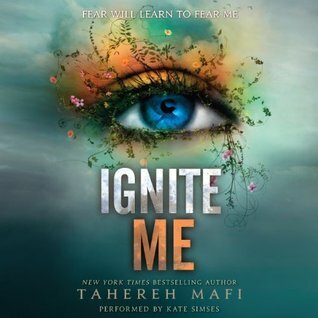 In Ignite Me, there are hints of the old Juliette, but Tahereh’s writing unfailingly reflects these changes at all times. Even more firmly structured, her prose is a thing of beauty, woven carefully like finest filigree work. Like its two predecessors, Ignite Me isn’t just about the romantic relationships, no matter how wonderful and complicated they may be. It is also about strong friendships, new friendships, tentative friendships, broken bonds and violated trust. Emotions are one thing Tahereh’s books never lack, and if not careful, the reader can easily drown in everything her characters feel. I’ve had the pleasure of listening to Kate Simses narrate Matched and Crossed by Ally Condie so I wasn’t unfamiliar with her voice. It is tender, almost shy, but confident if need be, and as such, it was perfect for Cassia. But for Juliette, I needed more strength, and while Simses did everything right and her voice characterization was excellent, the timbre of her voice was simply wrong for this story. I will gladly pick up something else narrated by her, but I do think she was the wrong choice for this trilogy. It’s true that Ignite Me could have benefited from an epilogue. The last few chapters don’t feel like the end of this story, but rather the end of its first part, with so much more yet to come. Perhaps that’s the best way to end a trilogy, with the whole world still ahead of our heroes, not just the good parts, but dangers and pain as well. Looking back, I can appreciate the openness, the life that awaits them, but when I first finished it, I felt just a little bit cheated. It’s always hard to say goodbye, but when you love a set of characters as much as I love Juliette and her friends, it becomes almost impossible. So I won’t. I own these books in every available format and I’ll surely revisit them many, many times. This is one of the series that I desperately need to catch up with. I loved the first book and novella, and the rest of the series was auto-buy, but I haven't had time to read them :( I'm glad it ended well for you, though, and I'll read it for myself eventually. Hopefully soon! You grabbed my attention when you compared Tahereh Mafi's writing to Stiefvater's because I agree, her books are art. Maybe I'll give this one a try because it's only a trilogy, and good in audio. Great review! I plan on reading the first book this month I really do! I think I have put it off long enough and I am pretty sure if I don't start it soon Kim is going to come after me! I love this - "It is the difference between writing your story for your readers, and unleashing your authorial voice because the story threatens to burst out of you, regardless of who might read it sometime down the line." Shatter Me didn't work for me so I didn't continue the series but I can see what you mean about the words just bursting forth - without compromise. I kind of liked the open ending as it let me imagine the world they would build. Wonderful review Maja, I was sad to part with this trilogy. P.S I hope you're doing better now, Maja. I haven't been around much because of school and exams keeping me busy, so I wasn't aware you were in the hospital. I read book one a month or so ago and while I was impressed and enchanted with the writing, the overall story failed to impress me, if I had read it when it came out I would have been on board but now, I am not. I don't want to deal with a love triangle and all the other nonsense. I have to disagree, I think Laini Taylor's writing is outstanding! Nevertheless, glad this one worked for you. I thought you were going to not like this one and then you surprised me. I'm so glad. I still need to listen to the other 2 books and I found my library has the second one and one of the shorts. I can't wait. I'm curious too... to see if I will feel the same way about the narration when I get to this book. I've still only read the first book (which I loved) but I do really want to read the rest. I definitely agree that there's artistry in her writing (as well as the others you named), something that can't be find in every story. I'm glad to see that you enjoyed this final installment Maja, I had been highly anticipating it too for the last year or so and in many respects it didn't disappoint. I too would have loved an epilogue too, but was satisfied in the way things turned out. Fabulous review as always! And its so great to see you back, I've missed you, I hope you've been okay! I have a copy of this but I haven't had the guts to pick it up yet. I won't try the audio version after your review, though. So many were angered by her choice in the love triangle and I can guess who she picked by some of the reviews out there, not sure that would bother me. I don't think it will. I still need to read Shatter Me, but I definitely appreciate authors who double as artists as well so I think I will like these books and the writing. It's really too bad that this wasn't quite the ending you wanted, but overall the series seems solid. I can't wait! I've not got to reading this series yet. But have it on the list for future. :) Thank you!